Vagarians Meeting on Friday 19th. Venue: Cafe Coffee Day, Korum Mall, Panch Pakhadi, Thane (West)...Time: 5 pm...open to all Vagarians. Very heavy rains likely in Western Bangladesh. Strong Winds and hailstorms likely. Adjoining Central W.Bengal can get strong thunderstorms. Kolkata vicinity could be lashed by heavy thunderstorm on Thursday. Strong winds likely. Light rains likely in some parts of Central Saurashtra. Clouds developing around Surat. 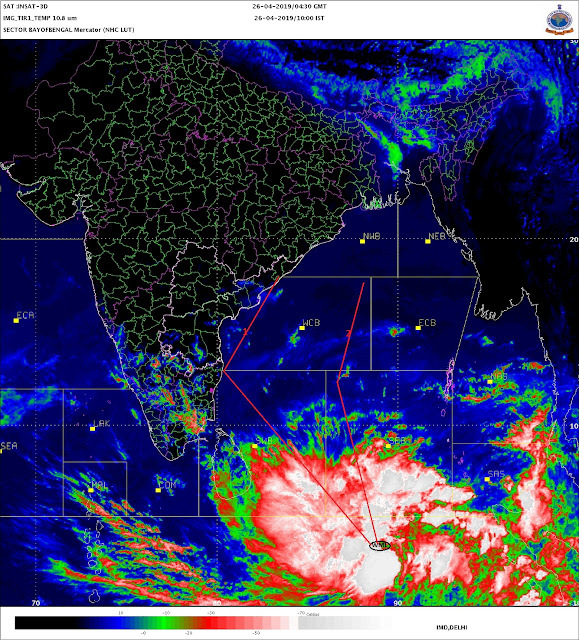 Friday 19th: Heavy Thunderstorms in Bangladesh and adjoining Meghalaya. Gangetic w.Bengal can get thunderstorms. Kolkata will see thunderstorms with squally winds. Gujarat region will be cloudy. Eastern parts of state will receive showers, with heavier falls in the Ahmadabad-Vadodra region. Surat will be cloudy with showers in some parts. Bharuch too will get light rains. Light rains possible in Rajkot and adjoining Central Saurashtra. Nasik district and Vidharbha in Maharashtra can get thundershowers in the evening. Thundery developments will be seen in the Eastern skies of Mumbai. Outer townships will get partly cloudy in the evening with thunder clouds in the East over the Ghats. In Pakistan, fairly heavy rains are likely in the region North/NE of Karachi. Hyderabad will be cloudy with light showers. Rest South Eastern Sindh will be cloudy. Delhi max temp for today : S 'Jung 37.1c, Palam 38.3c. Rajkot max temp 39.8c & Surat max temp 31c for today. Kodaikanal max temp 21c today. In your analysis you are not tracking IOD. Skymet predicted below normal rains in August based on negative IOD. The IOD which is now weakly positive is progressively projected to turn strongly negative by September by most international models. ENSO similarly which is neutral is projected to be neutral throughout JJAS period though tending to be in the positive side. We need to critique Skymet. The IMD came out strongly critiquing Skymet, even questioning whether they have any dynamic models at all as claimed. Today, the South Asian Monsoon Forum is meeting and they will come out with their forecast. A week from now, the IMD. So we need to come out with an alternate forecast pretty soon. Rajan: No Rajan, I have not overlooked the IOD. You must have read in my MW-1, that at present we are not chasing the Quantum of rain, only arriving at the Date of Onset. We will initially follow up for the date of onset. This I have explained earlier.